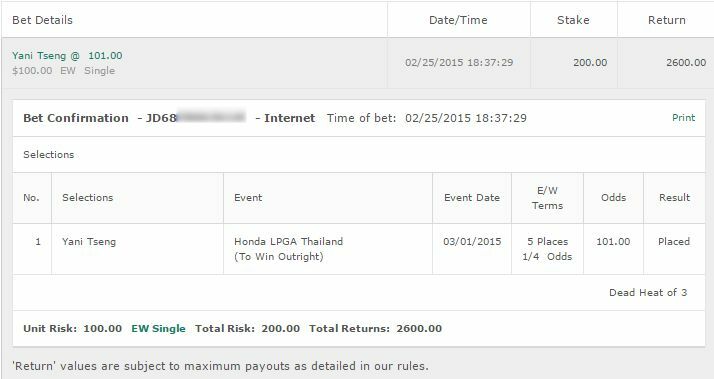 We’ve got our Twitter account going and you can follow us at @GolfBetTips. Might do some live betting and additional round betting and post on there. Stenson made a great challenge but unfortunately he just couldn’t play above average in the final round. Thankfully he held on for a place and a cash at least. This week we have the WGC, PGA and LPGA events. 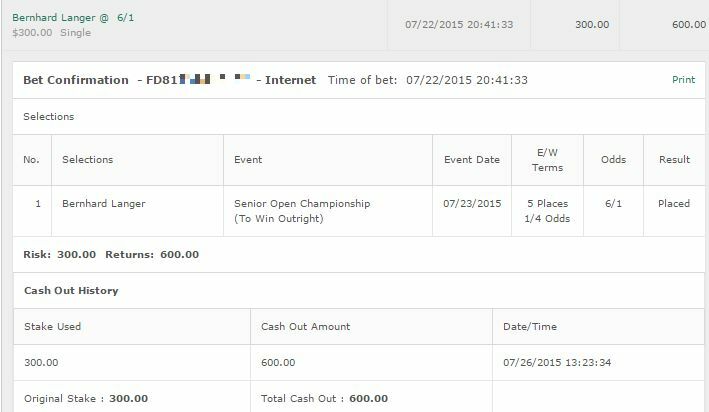 We’ve got the WGC Dell Open Betting Tips in a separate post than this one. On the PGA Tour it’s a slightly weakened field but honestly it’s not that bad. We’ve got some real talent in there like Graham Delaet, Scott Brown and Ian Poulter. The good thing is with no stand out winner the odds are huge for most of the golfers. You could probably blindly bet any of the top 20 to win or even come in the top 10 based on their odds and it’d be +EV. We’re going to place a quarter unit on Scott Brown to win and E/W. We had him last week based on his current form and he didn’t do too badly last week coming 27th at the Hero Indian Open. We were hesitant about him due to the field but that’s not an issue here, and he’s a previous winner of this tournament. He had a 64th place finish in 2014 but that looks like pressure from being the champion. We’ll be backing him. We’re also betting a quarter unit on Boo Weekley. He’s had some poor form lately but we really liked his performance at the Phoenix Open. We’ll be backing Boo to win and E/W here as the price is right. Boo has some solid history in this tournament and we’re hoping he can recapture his Phoenix Open form. We’re also on Chesson Hadley and George Coetzee both for quarter units to win and E/W, although we don’t have the same confidence level as we do the above two. With Hadley – man, there’s just something about the guy we’ve always liked. I’ve been watching him play lately and I actually have seen some things I’ve liked – yes even when he hit a +10 at the Valspar. I think he will be rested and might just surprise people. With Coetzee it’s more the motivation level. He should be in the WGC Matchplay and he’s going to be coming here to prove something. We’ve seen George dominate before and we hope he will have that same level of focus. We recommend betting all of these at https://www.GTBets.com. Only one betting tip here. We have a feeling Lydia Ko might get back on track with a win here but the odds aren’t worth it. 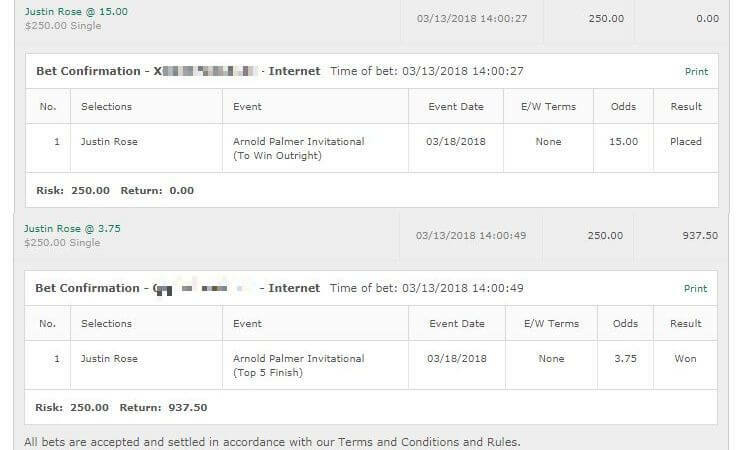 Instead we’ll go for the 33/1 Cristie Kerr and you can get those odds at https://www.GTBets.com. Some solid course history and we like what we have seen from her this season. She’s starting to warm up and her performances in the HSBC and JTBC were excellent.